If your teen has an eating disorder—such as anorexia, bulimia, or binge eating—you may feel helpless, worried, or uncertain about how you can best support them. That’s why you need real, proven-effective strategies you can use right away. Whether used in conjunction with treatment or on its own, this book offers an evidence-based approach you can use now to help your teen make healthy choices and stay well in body and mind. When Your Teen Has an Eating Disorder will empower you to help your teen using a unique, family-based treatment (FBT) approach. With this guide, you’ll learn to respectfully and lovingly oversee your teen’s nutritional rehabilitation, which includes helping to normalize eating behaviors, managing meals, expanding food flexibility, teaching independent and intuitive eating habits, and using coping strategies and recovery skills to prevent relapse. 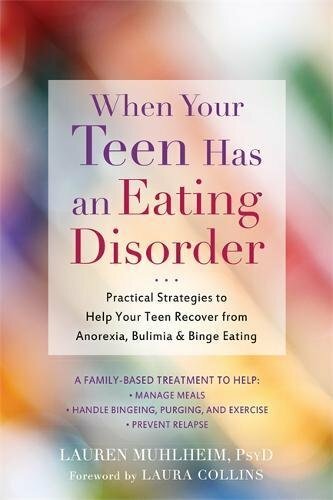 In addition to helping parents and caregivers, this book is a wonderful resource for mental health professionals, teachers, counselors, and coaches who work with parents of and teens with eating disorders. It clearly outlines the principles of FBT and the process of involving parents collaboratively in treatment. As a parent, feeding your child is a fundamental act of love—it has been from the start! However, when a child is affected by an eating disorder, parents often lose confidence in performing this basic task. This compassionate guide will help you gain the confidence needed to nurture your teen and help them heal. Click here to purchase this book on Amazon.